Pretty Good idea for taking indoor temp and humidity to the weather module! but would be great to get the symbols vertical for better screen use. @apm1007 Thanks for your feedback! @fewieden do you want me to tag you in these issue reports? @MichMich sure you can tag me it will not hurt, but I'm back at work now, so I can't promise anything. Decimal symbol was not implemented, but still documented in the readme. I added it and it will be in the next pr. I'm not sure yet why the forecast table has this spacing. Will have a look when I find time to debug this. 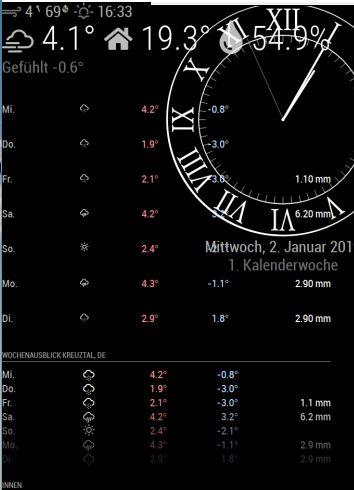 The indoor values are horizontal like in the currentweather module. I made them now smaller and vertical. Also added a class to it so people can style it individually. Will be in next pr.